Add some sparkle to a special someone's day. Everyone deserves fizz with their festivities and this premium Prosecco will definitely provide that! 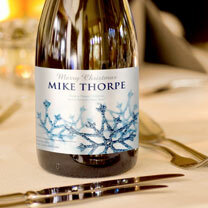 This fine sparkling wine is perfect for toasting over a special dinner, or enjoying a celebration. Presented in a silk-lined black giftbox. Personalisation: name up to 25 letters and message up to 80 letters (2 lines of 40 characters per line max.). Accents and other symbols cannot be printed.